Motto: "By his blood, the Horde lives." Physical Description: A large cloak covers the pallid face of this brooding warlock. He wears tattered robes and carries with him a wooden staff to support his crooked gait. 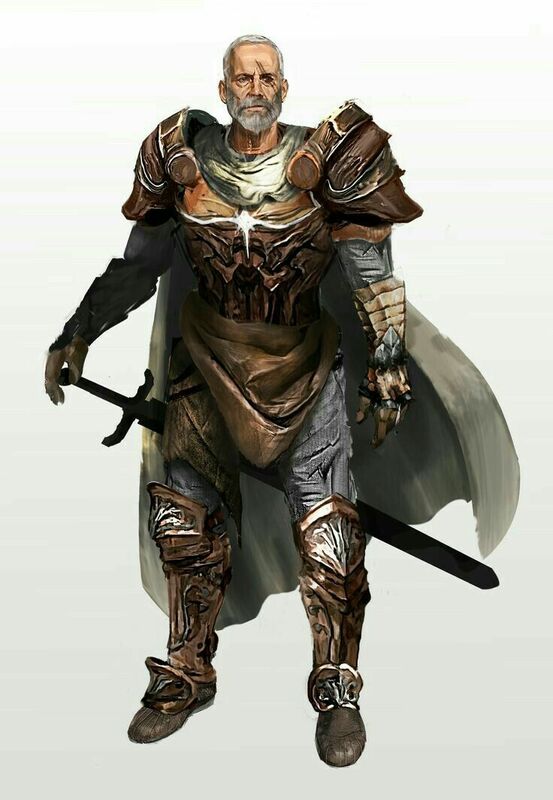 Underneath the shadow of his hood appears a gaunt looking orc with coarse dark brown hair, and a scar to his missing eye that runs down his forehead and cheek. His yellow-green skin is covered in blisters and scars, masked by the layers of clothing he wears to keep the burning Durotar sun from furthering damaging it. At his heel is his summoned minion from the twisting nether, a daemon from hell ordered to do his bidding and tear to pieces any that dares interferes with his plans. Brief History: Kazgrim was born sometime before the Rise of the Horde, on the planet Draenor. 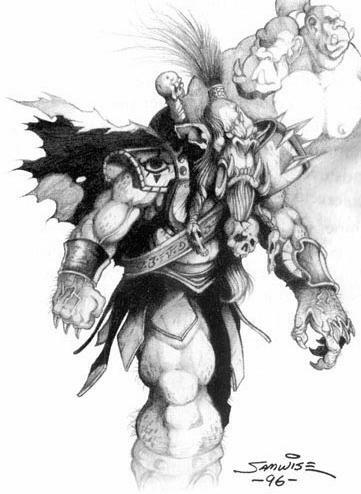 He served in both the First and Second Wars alongside his chieftain Kilrogg Deadeye. Originally a shaman, he was one of the few that followed Gul'dan and learn about the demonic arts. With his new abilities, he fought alongside the Horde in their invasion of Azeroth, and was eventually captured along with the rest of his clan and put into internment camps in Lordaeron. Having escaped and fleeing to Kalimdor with Thrall and the new Horde, Kazgrim has found it hard to let go of the powers he has learned to wield. But by swearing fealty to Thrall and his new Horde, Kazgrim has pledged to use his dark arts for good. Or so it would seem. Motto: "Keep right on to the end of the road, though the road be long you gotta stay strong"
Wrinkles fill the face, Burly & a bit Muscular, looks a bit like Lothar himself! Lorphar was born in the Stormwind Fields standing right outside it's gates, Farms fill the plains, fast forward there's the first war which fortunately he lived through, fast forward more the second war came and he served under the command of Lothar himself, he fought many battles & had many experiences, he even was once captured him & his comrades while on patrol by blackrock orcs and taken hostage, almost a whole week of interrogation, torture, and murder, he tried to rebel and escape but he fell unconcious for a long time, then he woke up to the sound of screams & cries, there were no guards, he stood up barely concious, and tried to wake his comrades but most of them were dead or too unconcious, he stepped outside and found alliance troops attacking the blackrock base, but just when hope was restored, Wrymkin troops showed up and the battle took longer, he made a run for it & escaped the base, stranded & wandering in the smokey desert of the burning steppes, finally he reached safety, South post alliance garrison, & went back home, events occured & alot of time had passed in peace, his sons & daughters married & happy, him living with the love of his life marcilene & meeting his grandchildren, there he recieved news of a troubled elwynn, he missed fighting & wandering outside his doorstep anyways so, he took up a worn shortsword, a battered buckler, and his rusty skills & set out to wander & save the folk of elwynn, as well as making quite a bit of profit. Title: lutenant of the 2nd exploration squad to Kalimdor. Birthplace: Lonch Modan, close to Wetlands. 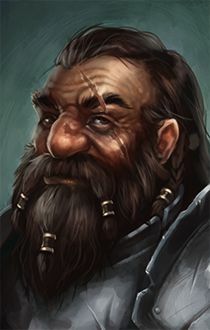 Motto: "If dont lead to ale then is not ok "
Physical Description: Big nose, semi-long beard with handlebeard mustache and short black hair, old face yet not old at all, tired eyes, muscular and tall for a dwarf. Brief History: Born in a tent in Lonch modan, his father was a mountaineer in Algaz station and her mother was died giving birth to him. Learning to survive alone in the woods he always look up to his father as a an example a lonely man with working habits. Soon at a very young age a group of human recruiters were asking for young dwarfs to help to an expedition to get information in Kalimdor. Not knowing anything Buri just sign the paper in hope to get some adventure and coin for his already old father, still working as mountaineer day and night. His father was very sad when his son give him the news and they both had a huge fight. Buri left his home (tent) the next morning with his axe only, starting a long journey by foot to Stormwind for his 3 months training before departure. In the big city he did a fair good job, yet not as good as many naturaly born warriors and fighters. So they decide to send him as last of his militia class to serve as fighter in the last line but also as chef, because he was not the best warrior but he made great meals with not many. They set sail to Kalimdor and he was put in the 2nd exploration squad all conformed by dwarfs, humans looked bad at them all the time. After a long trip, they set camp in a group of islands south durotar, the gnome cartographer, a very old gnome, didnt know that those islands were now part of a newly established zandalari troll tribe. Witouth sight of danger the generals set camp. The same night a group of trolls attacked killing lot of men, with only a knife Burin save most of the men in his Squad and one human general. This give him the promotion to lutenant. With half the group they set sails with the last ships to a northern position. Sadly for the army the trolls put spells and witchcraft stuff in most of the survivors, so they died after days of agony. So there were only 6 dwarf left from the 2nd squad, yet they finished their mision, to get an orc for interrogation with the help of human translators. With this information all the expedition go back, with new plants, animals, weapons, and information about Raxor hill defenses and secret passages. Back in storwind Burin get discharged and paid for his service, but a letter came to him saying that his father died a week ago because of a huge spider attack. Sad and lonely he found peace in the storwind catedral were he met Lord grayson and he took him under his wing as a newly added paladin of the light. Lord grayson send him back to dwarf lands as a test to see if he can really handle the real training that takes being a paladin. Now lonely and broke Burin have to get his way in the cold mountains and learn from different teachers around the eastern kingdoms to finally get back to Lord Grayson to fully finish his duty.